addiction’, and just presents to you the facts. I will be able to give you the skills, resources and beliefs you need, in order to stop smoking in the easiest possible way. This programme demonstrated a 92.5% success rate in a recent research project – this is twice as high as the NHS stop smoking clinics. 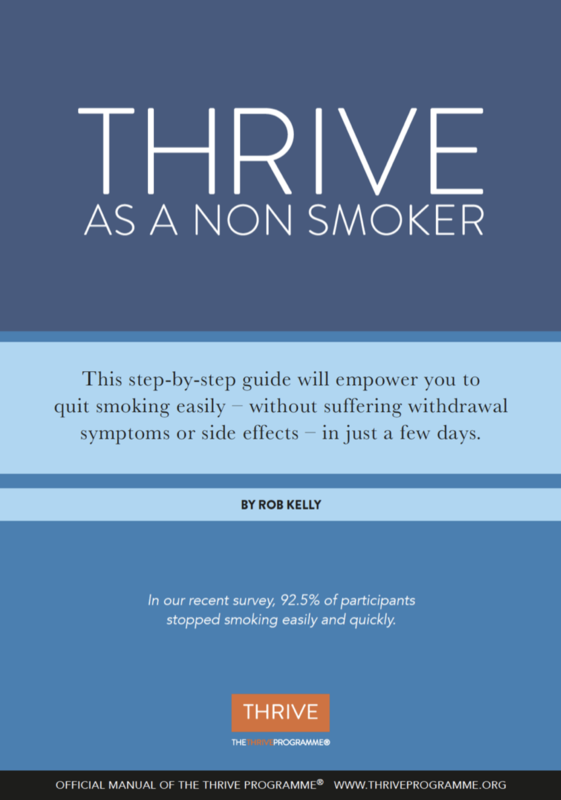 This is a totally unique approach to quitting smoking, and developed by Rob Kelly who has personally stopped over 10,000 smokers. There are 4000 chemicals in Tobacco smoke. At least 250 of these chemicals are known to be harmful, more than 50 are known to cause cancer. ‘Thrive as a Non-smoker’ has a proven 92.5% success rate. It is THE proven way to give up smoking – easily – for good. The Thrive Programme® takes the power out of the cigarette and gives the control back to you, making it easy for you to become a non-smoker. If you’re on this website we understand that you are already motivated to quit smoking. And you’re probably familiar with the BMA’s statistics that smoking causes over eighty thousand deaths a year. You will have seen the health warnings emblazoned on every packet of cigarettes you buy, and you may well have already tried – and failed – to quit using some form of treatment such as nicotine replacement therapy, patches or electronic cigarettes (vaping). You might have signed up for ‘Stoptober’, the NHS’s drive to help people kick the habit, but so far nothing’s worked for you. The good news is, the Thrive Programme® is a quick, easy and predictable way to give up smoking for good. You might be afraid of cravings, addiction, withdrawal symptoms or weightgain: rest assured that these are all addressed by the Thrive Programme®. ‘Thrive as a Non-smoker’ allows you say goodbye to bad breath, wheeziness and that pack-a-day habit and start to enjoy so much more from life. ‘Thrive as a non-smoker’ shows you why so much that you’ve been led to believe about smoking cessation is just not true. The programme de-bunks addiction theories, removes fear of withdrawal symptoms and cravings, and makes it so easy for you to become a non-smoker. The ‘medical model’ of smoking cessation is unreliable and is based on an addiction theory. This addiction theory is widely promoted by the political agenda, and peddled by nicotine companies, but it is not supported by research. This is why you never crave cigarettes in your sleep, and pregnant women find it comparatively easy to give up smoking. If the addiction theory were true, this would not be the case. ‘Thrive as a Non-Smoker’ addresses the root causes of your smoking habit by helping you to better understand your thinking styles. Within The Thrive Programme® we know that the addiction theory just makes it harder to quit, so the programme discusses the flaws of this theory, backed up with scientific and neurological evidence, and helps you to gain the psychological skills and resources you need in order to stop smoking for once and for all. The Thrive Programme® gives you back control. At The Thrive Programme® we want you to optimise all aspects of your life: becoming a non-smoker is just one step in the process. As you work through ‘Thrive as a Non-Smoker’ you’ll also gain insight into how you can regain power and control in all areas of your life: relationships, health and fitness, work and leisure. Many people complete ‘Thrive as a Non-smoker’ and go on to complete The Thrive Programme®. Reduce your risk of disease, cancer and premature death by booking up a ‘Thrive as a Non-Smoker’ course today. The course consists of 1-3 sessions – you have nothing to lose and everything to gain. Get in touch with me today, and let’s get you over this thing! The Thrive Programme® is a life-changing psychological training programme that empowers you with the skills, insights and resources in order to take control of your life, overcome any symptoms or problems you have, and thrive!